This spring semester, a group of Mihaylo College undergraduate operations and supply chain seniors interned at The Safariland Group, an Ontario, California-based manufacturer of law enforcement protection products founded and owned by alumnus and donor Scott O’Brien ’77. 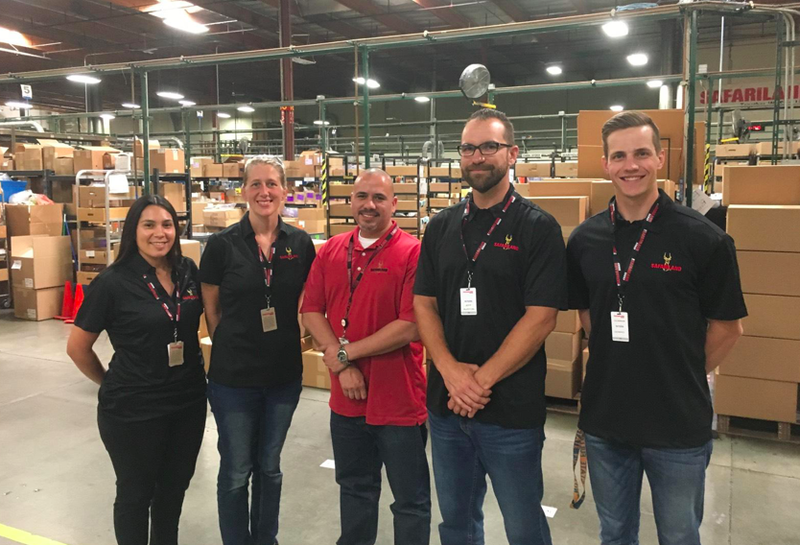 This capstone course was developed by the CSUF Operations and Supply Chain Management professional board to give students applied experience in lean operations. Students share the highlights of their internship experience, how it dovetailed with their academic program and the impact on their career objectives. What encouraged you to take this internship with Safariland? Jeff Burton ’18: I wanted to apply what I learned in the classroom to a real business scenario and gain experience and a deeper understanding of operations and the supply chain in a large-scale business application. My goals were to work with a team to achieve supply chain process improvement and see real-time results. The most important objective for me was to give as much of my input and effort toward our team’s project that I could possibly give during our meeting days. It succeeded in meeting these expectations with the impact that we made and what our team accomplished. Mason Padjen ’18: I want to get into the automotive industry and Lecturer Casey Kleindienst told me about his friend Bob Bennett, an expert veteran at Toyota. I am trying to make the transition from a marketing background to a career in supply chain, and this internship was the perfect opportunity. My goal was to contribute something enduring in an internship, and this program definitely fulfilled that. What were the highlights of your internship experience with The Safariland Group? Phil Perez ’18: Using various lean production tools was definitely a highlight for me. Early in the internship, we constructed a value-stream map to identify inefficiencies within Safariland’s production process. This was very intriguing, because it provided me with a tool to identify opportunities for process improvement. Dominik Dobrowolski ’18: Safariland always told us to have respect for people. No matter what job title you hold, no one is worse or better than you. We met so many people from so many backgrounds, and we helped those who make a difference in the company, such as the frontline associates and managers. Padjen: Our second-to-last meeting was particularly memorable. That was the day we gave our presentation and recommendations. Giving a presentation in a real-life business scenario is much different than presenting for a class project to my fellow students. This presentation was for a real project with a real impact on the company. How was this opportunity integrated into your degree program? Perez: This internship helped me apply several supply chain concepts and strategies that I learned in my courses. The presentation involved using a lean production technique called the “seven steps to problem solving” as a guide to capture the analyses conducted during the internship. Using this template, we presented our problem statement, hypothesis, data collection and results of our study. Dobrowolski: Lean operations is a large component of what we learn in the classroom and many companies follow or try to follow that model. This internship allowed us to be fully immersed in the lean operations world, to greatly impact productivity, improve people’s lives and see profitability. The final presentation was to showcase the progress we had made to upper management, particularly Scott O’Brien and Vice President Scott Carnahan, as well as Mihaylo College faculty. Our teams were split into two groups and we focused on those projects to more efficiently tackle the problems we discovered. Padjen: I learned a lot more about how the different parts of a business work together in 16 days at Safariland than I did in years in the classroom. The presentation was a summary of our individual projects at a high level and with costs and improvements laid out so that the company’s management had a clear view of what we did and what we were recommending be done in the future. What advice would you give to other students considering careers in operations or related internships? What skills or aptitudes will help you succeed? Perez: Try to get as much exposure to the various departments as possible to see what is most appealing to you. Interns interested in operations should have a basic knowledge of supply chain principles, business software and a strong desire to apply critical thinking techniques to solve problems. Dobrowolski: All manufacturing and major service companies will require operations or supply chain employees, so there are many opportunities for you. Some skills that I found to be very helpful are determination and perseverance. There will be many days when things won’t go your way but you must dig in and continue to modify your strategy. Communication is extremely important. Be understanding. People will be resistant to change and it is your job to show them why the change is beneficial to them. Finally, without respect, you will not go far in this field. You are working with many different people and if you are not willing to offer basic respect, you will have limited opportunities to grow as an individual. Padjen: Keep an open mind about which part of the supply chain you are interested in. I realized I would rather be in the manufacturing end of operations rather than purchasing after spending some days walking around the production floor and other days sitting in an office chair for hours. When you go to interview or make your résumé, find points in your experience that relate to supply chain concepts even if it is not specific supply chain experience. For example, a time you had to distribute a budget or assignments to a team. How was Safariland Founder, Owner and CSUF Business Alumnus Scott O’Brien ’77 impactful to you and the other interns? Perez: Scott O’Brien was great. He provided us with real insight on problems that many companies struggle with on a daily basis. He was very motivated in correcting the problems that we identified and utilizing the counter measures we suggested. Burton: Scott O’Brien has a very clear vision for his company and cares tremendously about its path. He also is very clear about Safariland’s culture and what they are trying to accomplish. Their mission statement is “Together, We Save Lives,” which is reinforced by a count of the number of lives saved on the wall at the company headquarters. He was very encouraging to all of us. He is an inspiration to me and I am very grateful for the opportunity he gave us. I also appreciate that, on our presentation day, he was very interested in what we accomplished and was very complementary to all of the team members.